The work doesn’t have to happen alone - join me and my team for Alexander Technique based group sessions with a twist! Details coming soon - email us for more info! Teamed up with Body Economics to design a dynamic workshop in self-care. As someone who's life revolves around working with others, I keep being reminded of the importance of maintaining one's own optimal vitality in order to be of sustainable service to others. I'm always relying on the skills of increased awareness for better movement practices that I learned through ten years of studying Alexander Technique. Look forward to sharing these tools with you. What We Teach: We are focused on the economy of movement so that you can function in the most efficient way. Oftentimes, the focus is on the person in need at the expense of the giver. We will help you develop your own practical self-care tools so that you are capable of more sustained work at a steady level without exhausting your natural resources. Who Is This For: health & wellness practitioners and instructors, all those who work in taking care of others. This could include: massage therapists, acupuncturists, reiki healers, caregivers, nurses, physical therapists, cranial sacral therapists, yoga & pilates instructors, etc. 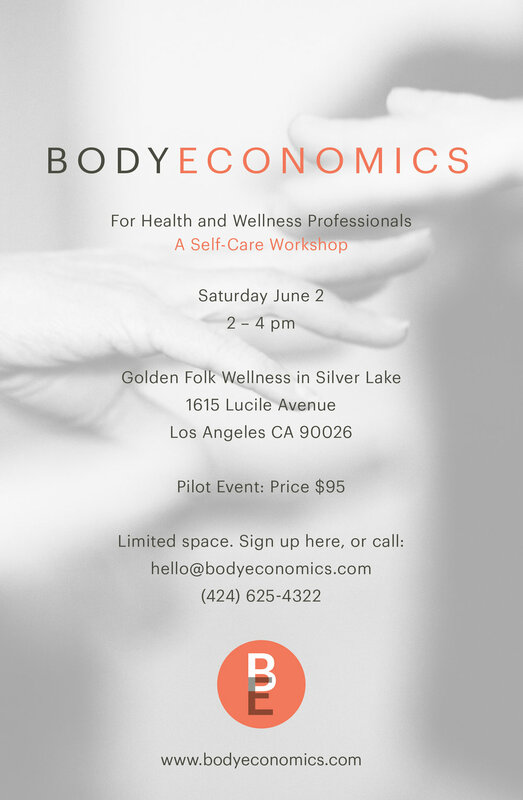 Support & Body Economics: learn how to operate from a consciously organized, energy efficient place when working with your clients. Preparation & Restoration: we will guide you through active rest, a power position that creates space for you to undo tension and re-organize. Standing & Bending: learn how to keep a healthy head, neck, back relationship allowing more effective ways to lower yourself when working with clients. This a conscious movement workshop with hands-on guidance. All three instructors have over 1600 hours (3 years) in hands-on training as certified teachers of the Alexander Technique. This is an initiative with Body Economics.